The Goddess Demeter is the embodiment of renewal, nourishment, fertility, birth, death and rebirth. She is considered the Goddess of the Earth and is associated with agriculture - the growing, harvesting and preserving of grain. She is the consummate devoted Mother who nourishes and provides for her children. Demeter derives from Greek and Roman mythology. She is symbolized as a sheaf of grain - wheat, barley or corn and is regarded as the Goddess of Springtime, millers and bakers, and for women who wish to bear children. The mythic tale of Demeter could not be told without the story of her daughter, Persephone, who was her only child whom she dearly loved and treasured. Persephone, who grew into a beautiful and charming young woman, drew the attention of Pluto, the God of the Underworld. One day while out picking flowers Persephone became enchanted by the exotic flower, narcissus. As she picked the flower the ground began to shake and a large chasm opened in the earth. Deep from within this chasm rose a black billowing smoke from which Pluto appeared driving his horse-drawn chariot, scooped up Persephone and carried her of to his Kingdom below to become his wife. 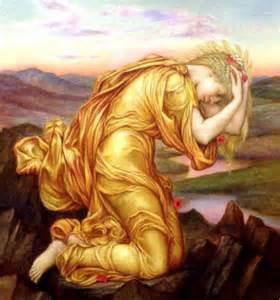 Demeter, not knowing what had happened to her daughter, searched the earth and the heavens hoping to find her. Days turned into months. Consumed by depression over the loss of her precious child, she ceased to remember her worldly duties as the Goddess of Grain and Growth... the plants began to wither and die... and the earth began to reflect the sorrow and despair of Demeter's heart. The crops ceased to thrive and the land became barren. Continuing her endless search, she lifted her sorrow to the heavens and cried, "Who will help me find my daughter?" Helios, God of the Sun, took pity on the distraught and grieving Mother and told Demeter of the plot Pluto had planned to kidnap her daughter to marry and become his wife. Outraged she went to her brother Zeus, King of all the Gods, and told him that if he did not return her daughter from the underworld that she would allow the crops to die and people would starve. So Zeus sent Hermes, the Messenger God, to the underworld with a command that Pluto was to return Persephone to her Mother. When Hermes arrived he found that Pluto had convinced the young woman, who had been refusing to eat, to partake of the luscious pomegranate fruit and witnessed that she had only eaten six seeds. Hermes knew that once she ate from the tempting fruit from this Kingdom she would not be able to leave so he struck a deal with Pluto. Persephone would agree to be his wife on the condition that he would allow her to return to her Mother once each year for six months, after which she would return again to the underworld to be with him for the remaining six months. Pluto agreed. Thus every Spring, Demeter made sure that the flowers bloomed, the crops grew to abundance and the earth was green and lush to welcome her daughter back into the world. When the Autumn Season arrived, keeping to her agreement, Persephone would once again return to the underworld and be Pluto's wife. During this time, Demeter in grief over the absence of her daughter, would once again be so stricken that she would cease her duties... the flowers and crops would wither and die, and the earth would again become barren. Until at last came Spring... with joy in her heart she would begin again to prepare the earth for her daughters return. To the Ancients this was the reason for the Cycles of the Seasons which was celebrated in Festivals. Temples were erected in Honor of Demeter, the Goddess of birth, death and rebirth. The characteristics of the woman who carries the qualitites of the Goddess Demeter, is someone who is always helping and serving others without expecting any recognition or reward in return. She is the devoted Mother, who is the giver of life and nurturing, of patience and unconditional love. She is selfless in her giving, forgives easily and provides for the needs of her children as her service to the world. Her nurturing extends to the earth and nature. She loves working in the garden, cultivating and tending the growing of plants. The negative aspect of this archetype is someone who is over-protective and smothers her children or others, often becoming dependent and making them feel guilty when leaving her. To cultivate and embody the Earth Mother Goddess is to call forth the qualities of devotion, selflessness, nurturing, patience and unconditional love in service to your children and family members, the caregiving and serving of others, or in propagation of plants and caring for the earth. You may recognize the Presence of the Goddess Demeter in yourself or someone you know or you can call upon Her Qualities to cultivate these characteristics in yourself giving Rise to the Goddess within.